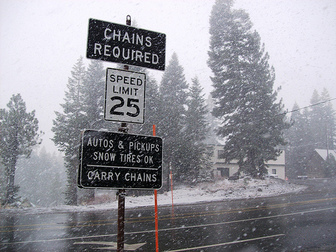 During snow cycles, snow chains are required in the Town of Mammoth Lakes and in many surrounding areas--even if your vehicle is 4WD and/or you have snow tires. Please be sure to carry chains and know how to install them. To get around town safely in the snow and freezing weather, consider keeping your car in our garage and using the Mammoth Shuttle whichs stop about 50 feet from the condo. (closest stops, #74, 75) Download the swiftly app for real-time shuttle info.